Effective January 1st, KRYSTEXXA was assigned permanent J-code J2507 by the Centers for Medicare and Medicaid Services (CMS). This code allows healthcare providers an easier and quicker method for getting reimbursed for KRYSTEXXA infusions. While already known that KRYSTEXXA would get the permanent code on January 1st, confirmation is always good. 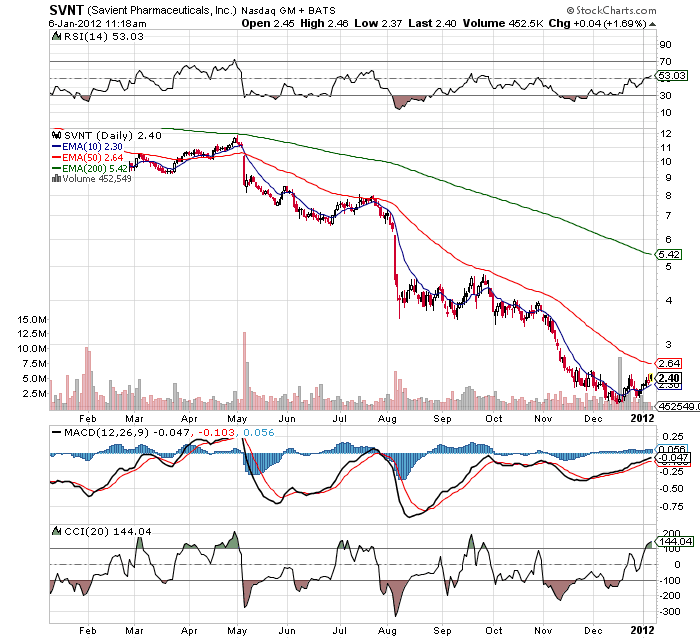 Saivent Pharma (SVNT) had a horrible 2011 due to slow sales from this new drug approved for treatment for refractory chronic gout (RCG). The J code will undoubtedly help. By all accounts, the new drug works and the only issue has been working out the reimbursement process. Considering the time it takes to work through the system, SVNT doesn't expect a major impact until Q2. At just $2.4 and with a market cap around $170M, SVNT has become an extremely cheap stock if this J code solves all the issues with sales. It seems bizarre that this would solve the problems, but it is an expensive drug. product-specific billing code, or permanent J-code, for KRYSTEXXA® (pegloticase) became available on January 1, 2012 . The new J-code, J2507, was assigned by the Centers for Medicare and Medicaid Services (CMS) and will help simplify the billing and reimbursement process for prescribers of KRYSTEXXA, the first and only U.S. Food and Drug Administration (FDA) approved treatment for refractory chronic gout (RCG). "The availability of a permanent J-code for KRYSTEXXA is a significant step toward ensuring that healthcare providers and their patients with severe and debilitating gout, or RCG, have access to the first and only product for RCG," said John H. Johnson , Chief Executive Officer and President of Savient Pharmaceuticals. Remember this stock was over $11 back in April. Disclosure: Long SVNT. Please review the disclaimer page for more details. Kraft Foods Is Worth How Much?